HARARE, Zimbabwe (AP) - Zimbabwe’s president has condemned the continent-wide African Union for recognizing Libya’s National Transitional Council at a recent summit, state radio reported recently. 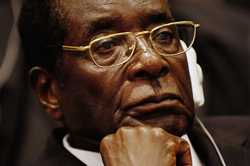 President Robert Mugabe returned to Harare late Jan. 31 from the gathering of African nations in Ethiopia. At the airport, he accused unnamed African countries of being “fronts” for Western powers whose “criminal” NATO bombardment of Libya helped lead to the killing of Col. Muammar Gadhafi, a former Mugabe ally, state radio said. The continental body didn’t even protest the NATO action, Mr. Mugabe said. He also said it was “unprocedural” for the AU’s Peace and Security Council to make the decision to recognize the NTC instead of the whole summit of leaders. Zimbabwe itself has not officially recognized Libya’s NTC and expelled the Libyan ambassador when he defected to the rebel cause during the uprising against Col. Gadhafi. State media said Feb. 1 that Mr. Mugabe complained the African Union should have taken more action to protest NATO bombings: “We said absolutely nothing. Even if we could not raise a force, at least we could have protested. How did we fail to say even no” to killings that included civilians in the NATO bombings? Col. Gadhafi became the first chairman of the African Union when it was founded in 1999 at a summit in the Libyan city of Sirte to succeed the Organization of African Unity that campaigned against colonialism for nearly four decades. Mr. Mugabe said the continent had long fought oppression but the AU council appeared to have “felt intimidated” to recognize Libya’s transitional authority, the state broadcaster reported. He said Mr. Gadhafi was killed “in broad daylight” and his children were hunted like animals, the independent New Zimbabwe media agency reported. “Then we rush to recognize the NTC” without demanding an investigation in Col. Gadhafi’s murder, Mr. Mugabe said. He cautioned that Western powers suffering the effects of recession could target other African countries for their mineral wealth and resources. “Who is next?” he said, repeating warnings he gave to his own party at its national convention in Zimbabwe in December that Western powers were not to be trusted.